Start off your visit on the 26th (Fri): take in the awesome beauty at Arches National Park. Here are some ideas for day two: admire the majestic nature at Dead Horse Point State Park and then let the river carry you with a rafting and tubing tour. For ratings, reviews, other places to visit, and tourist information, you can read our Moab online journey planner . San Jose, Costa Rica to Moab is an approximately 14-hour combination of flight and car. You can also fly; or drive. Traveling from San Jose to Moab, you'll gain 1 hour due to the time zone difference. 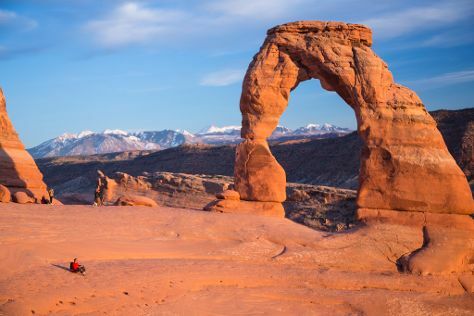 When traveling from San Jose in July, plan for somewhat warmer days in Moab, with highs around 42°C, while nights are about the same with lows around 22°C. Wrap up your sightseeing on the 27th (Sat) to allow time to drive to Bryce Canyon National Park. Start off your visit on the 28th (Sun): take in breathtaking views at Sunset Point, then hike along Navajo Loop Trail, and then stroll through Navajo/Queens Garden Loop. To find ratings, maps, where to stay, and tourist information, go to the Bryce Canyon National Park visit app . You can drive from Moab to Bryce Canyon National Park in 5 hours. Another option is to do a combination of car and bus. Traveling from Moab in July, expect Bryce Canyon National Park to be little chillier, temps between 32°C and 10°C. Cap off your sightseeing on the 28th (Sun) early enough to go by car to Zion National Park. On the 29th (Mon), explore the wealth of natural beauty at The Narrows. To find more things to do, other places to visit, traveler tips, and other tourist information, you can read our Zion National Park route planner. Traveling by car from Bryce Canyon National Park to Zion National Park takes 3 hours. Plan for a bit warmer temperatures traveling from Bryce Canyon National Park in July, with highs in Zion National Park at 40°C and lows at 17°C. Finish your sightseeing early on the 29th (Mon) to allow enough time to travel to Park City. Start off your visit on the 30th (Tue): play a few rounds at Wasatch Mountain- Mountain Course, then relax and rejuvenate at some of the top local wellness centers, and then wander the streets of Park City Main Street Historic District. To see photos and more tourist information, go to the Park City trip maker app . Do a combination of car and flight from Zion National Park to Park City in 3.5 hours. Alternatively, you can drive; or do a combination of car and bus. Traveling from Zion National Park in July, you can expect nighttime temperatures to be a bit cooler in Park City, with lows of 12°C. On the 31st (Wed), wrap the sightseeing up by early afternoon so you can travel back home.